L.A. Youth writers review the Where the Wild Things Are soundtrack, Death Cab for Cutie, Eminem and Jack’s Mannequin. Our staff writers say that New Moon won’t disappoint. Janie, 16, says this feel-good movie is perfect for the holidays. These are letters we received about stories that appeared in the October 2009 issue of L.A. Youth. Gabe, 17, talked to experts about swine flu and how to avoid getting sick. 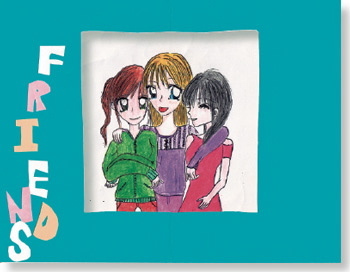 The girls in 16-year-old Sally’s group home have been there for her like sisters. Sally says she likes feeling like a big sister now that she's one of the oldest girls in her group home. I have two brothers but I’ve always wanted a sister. My ideal sister is someone who goes through the same things you do and can relate to you. Someone you share your feelings with and is your friend. I asked God for a sister and never got one. It wasn’t until I was sent to a group home that I realized I got what I asked for. All the girls at my group home are like sisters to me. I live in a group home with five other girls but I still get to see my parents on the weekends. Teens live in a group home to get help with their problems like drugs, running away, ditching school, cutting, drinking or fighting. I went to my first group home when I was 10 because I was ditching school and getting into fights. I didn’t change so they sent me to a stricter group home out of state. I was doing good so they moved me back to California to the group home I’m at now. When I came to the group home I was 13 and the other girls were at least two years older than me. They said I was better off hanging out with someone younger. I felt that they didn’t like hanging out with me. Some would be mean. They’d do little things like when I walked out of the bathroom one girl said, “Yeah b**** get out.” Another time I sat down on the couch in the living room and they said, “You can’t sit here, it’s saved.” I think they wanted someone else sitting next to them rather than me. I felt like I didn’t fit in and I felt alone. I wanted to go back to my other group home. After about a year, I got more mature and the girls started to accept me. I started to hang out with them and they got to know me. I started to open up to the girls. One time I made my dad mad so he told the staff that I had flipped him off. I started crying because I felt like he betrayed me because I had already apologized to him and he had said, “It’s OK, I love you.” A few days later we had a meeting called “house group.” The girls asked me what had happened because they had heard me crying. I told them that I got into a fight with my dad. They said they were worried about me. I was surprised that they cared. It made me feel happy that the girls were there to listen. As we got to know each other more, we became really good friends. We have fun talking about anything when we eat together at the dining room table. One time we were messing around and talking about all the things we would do at a restaurant that would make people think we were crazy. Rochelle* said she was going to pull a napkin out of her mouth slowly and put it on her lap. We were laughing really hard. Every now and then the adult staff let us have parties just for fun. These are the best times I have with the girls because it’s spontaneous and you never know what’s going to happen next. We watch movies and eat a lot of junk food. At one party I ate five or six pieces of pizza, a couple cups of ice cream, several popsicles, a couple Zingers, chips and gummy worms and drank soda. In the middle of the party, all of a sudden we started throwing Zingers at each other, even the staff. It was so fun. Another time, one of the girls was saying she didn’t like men with chest hair. I said, “Oh, so you like women with chest hair.” She played along with it and said, “yes.” Then I joked, “So you’ll like me.” Everybody was laughing. It makes me happy when they like my humor because I feel special. My roommate Emily has had a big influence on me. She has gone through much more than you could imagine. What is so special about her is that she doesn’t care about what others think. She tells strangers things that I couldn’t even tell my friends, like her problems with her dad and getting in trouble at school. It looked so easy when she talked about her life. It helped me realize that just because you have a hardship in life, it doesn’t mean you should sit there feeling bad for yourself. Now I tell people about my problems. It helps me to not keep everything inside. Another person I’m close to is Angela. As soon as she moved into the group home, we got along. We would watch Korean soap operas together even though she didn’t understand what they were saying. Once in a while Angela and I would get into fights. Once Angela told me I should break up with my boyfriend because she thought he was making things up to get my attention. I got mad and defended him but that made her mad. But we didn’t stay angry at each other for long. After a few minutes I told her that she was important to me. She told me I was really important to her too. Then she said, “I love you and I care about you. I just don’t want you to get hurt.” I said, “I love you too.” It sounds like a corny movie moment but it was important because it showed we were really good friends. The girls in the group home helped me become a person I’m proud to be. I’m more confident because they tell me I’m smart, pretty and funny. They tell me I’m a good friend and that they’re glad they have someone like me to talk to. When I leave the group home and move back with my family, I’ll miss them. * The names of Sally’s friends have been changed to protect their privacy. If you liked this story, check out our Stories by foster youth page to read other stories about life in the system.